Anglers can't help but be seduced by visions of catching big fish in the secluded moving water of a river. Anglers are naturally attracted to rivers. However, rivers present several issues for floating downstream fishing. Of course, current is the major factor when it comes to fishing. If the current is too fast, safety becomes more important than catching a fish. Not enough current means an angler will have to carry or drag their kayak from pool to pool. Fortunately, the introduction of specially designed fishing kayaks has addressed most of these issues, including presentation of lures, tackle and rod storage, paddling techniques, anchoring and casting from a sitting position. One of the leaders in designing and construction is Jackson Kayak, which offers a wide variety of fishing kayaks for every fishing situation or body of water. Bassmaster Elite Series professional angler Brandon Coulter is just one of many anglers taking up the sport of fishing from a kayak. Coulter fishes from a Jackson Kayak Big Rig when fishing rivers. According to Coulter, the Big Rig kayak is the most stable when standing up, which is a big plus for a big guy like him. 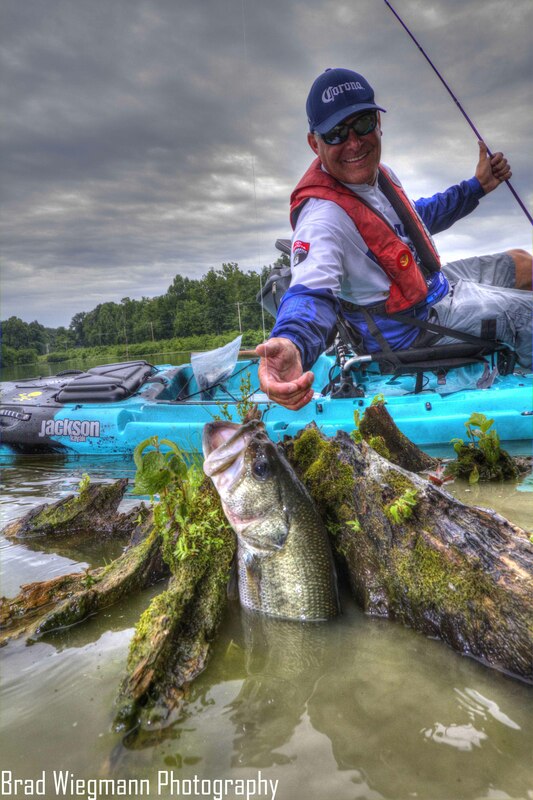 Jackson Kayak Big Rig features more storage capabilities and an elevating seat that lets Coulter to sit up higher allowing him to see into the water and make more efficient casts. Brad Wiegmann just wants to fish, but his wife told him to get a job so he works as a freelance outdoor writer and photographer when not fishing. Brad has written for countless magazines and websites. Besides being a freelance outdoor writer and photographer, Brad also has his own award winning website www.BradWiegmann.com.